With lanterns, we remembered the time when the 75 trapped men and boys were found and brought into the light again. It was also the 200th anniversary of the Davy Lamp which was used in the rescue. The artists were: Louise Bradley, Alison Ashton, Kate Hancock, Ken Patterson & Tessa Green. They worked in the nine primaries, with Brownies at St Teresa’s Hall, in Woodlands Community Centre & with family groups in Chillingham Rd, & High Heaton Library. Heaton Voices and Flotsam sang songs from the Heaton Main Suite, Meze Mundo World Carnival Band played, Sgt Ninji Li from the Heaton Manor cadets played Highland Pipes and Chris Bostock, The Storyteller, told the tale of disaster and the rescue. Jill Bennison managed the event. 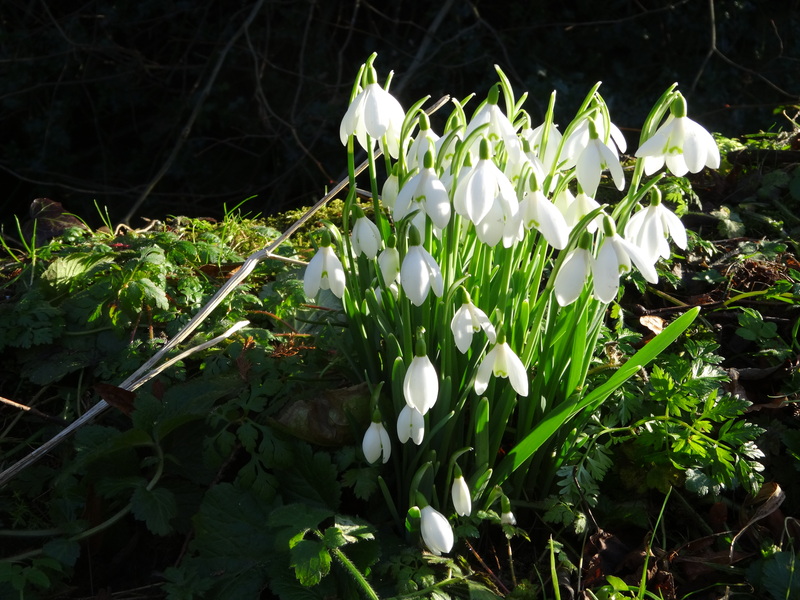 Snow drops bloom in February after their cold winter underground, and it’s the anniversary of the time when the bodies of the men from Heaton Main Colliery were rescued. Jo Bulter, gardener, visited each primary school and planted snow drops with a class in suitable places in the grounds, ready to bloom in February, the time the miners’ bodies were put to rest in 1815. We planted further snowdrop bulbs (in the green) in special places in Heaton / the Ouseburn Valley throughout 2015 and 2016. Residents told us where they were planted and we put the site on our map. We reached our hope for 75 sites in our area but come next spring we hope to plant some more! We’ve given 4000 snowdrops to local schools, churches and residents (to plant in their private gardens). Most of the snowdrops were distributed at the Spinney 2nd May event and at Heaton Festival on the 27th June 2015. Sally Cooper hands out snowdrop bulbs at Heaton Festival. The white stars mark where the snow drops are planted! And now there are more than 75 new sites ready to bloom next spring. The 75 men and boys of the Heaton Main Mining Disaster remained trapped under ground from 3rd May 1815 until March 1816. The snow drops will help us remember the end of their entrapment and burial in St. Peter’s Churchyard, Wallsend. If you’d like to tell us where you’ve planted more snowdrops, send us an e mail, below.